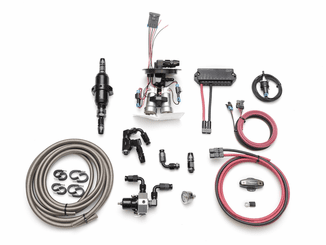 MAP or static referenced direct injection supply fuel system up to 800 rwhp with dual fuel pumps (recommended to run one pump full time, then activate secondary pump under load) with gasoline or race gas only (not E85). 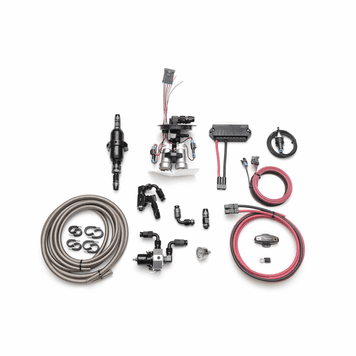 Supplies High Pressure Fuel Pump (HPFP) and port injection (and small wet nitrous) Includes in-tank supply system that retains OE transfer, fuel level sender, and EVAP functionality, upgraded feed and return lines, high capacity filtration and check valve, flow through t-block direct mounted on HPFP inlet tube, high capacity F1i regulator with provisions for both static and MAP reference. 1. Fuel pressure with static fuel pressure regulation must be set to 43 psi + maximum boost for proper injector spray pattern. 3. Use L1E or L2 fuel system to operate outside these parameters.